This section provides a tutorial example on how IE renders images specified in 'embed' elements. Result is very bad comparing with Firefox 3. 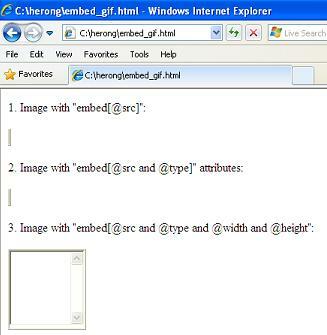 To see how IE (Internet Explorer) handles the <embed> elements with image files as data values, I opened embed_gif.html created in the previous section with IE 8 and got a warning message first, "To help protect your security, Internet Explorer has restricted this webpage from running scripts or ActiveX controls that could access your computer. Click here for options..." in the information bar. I clicked the warning message and selected the "Allow Blocked Content..." option. The "Security Warning" dialog box showed up saying: "Allowing active content such as script and ActiveX controls can be useful. However, active content might also harm your computer. - Are you sure you want to let this file run active content?" IE 8 gives two unnecessary security warnings before finishing the page. Test 1, 2, 3 show that IE 8 fails to locate any plugin to render the image provided in the "embed" element. Test 3 shows that IE 8 uses scroll bars if "width" and "height" attributes are provided. Comparing with Firefox 3, IE 8 behaves badly on rendering images provided in "embed" elements.